My name is Evans, I am the newest member of the family. 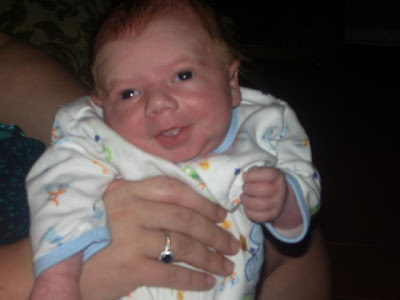 I made my entrance on March 11, 2009. My brother Ty makes me laugh, when he talks to me. I love my momo and papaw alot. Oh, and my mom and dad and WenWen and Uncle Dave and Bailee and Dylan too. I might grow up to be a caterer too.....you never know! Oh, Grandchildren!!! Now There Are " 4 "
We so enjoy our grandchildren. They are the joy of our lives. When is a King Cake not a King Cake? Yesterday I received a call from a new customer that wanted a King Cake...well Mardi Gras has been long gone, so what to do? I asked her if she would like a shamrock. She said it really didn't matter, but she wanted to order 2 small cakes and 1 large one, for the next morning. I made her 2 small "crosses" and 1 really large Easter basket. I had alot of fun with them, especially doing the basketweave with the dough on the basket and twisting the handle. She left all the details up to me. The fillings were all cream cheese and apple, strawberry and blueberry, alternating here and there. 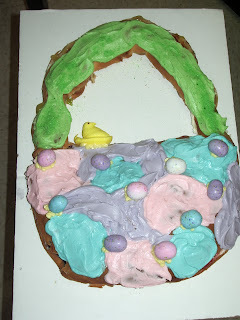 I used colored icings and a yellow peep with pastel robin egg candies. 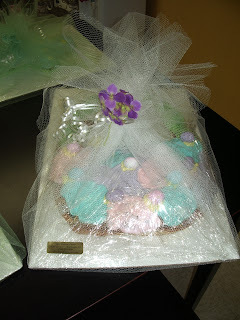 I decorated the filled cakes and wrapped them for the occasion using tulle, flowers and ribbons in pastel colors. This morning when she came to get her order, she was so excited! She had never even heard of anyone making a shape out of a King Cake......now the only problem I have is trying to figure out what to do as a design after Easter. Cream cheese, they really love it. You have a budget, we have a menu! 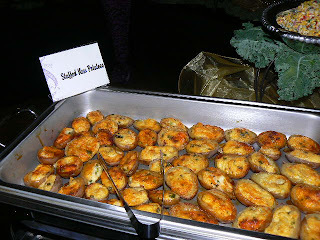 In addition to our "Premiere Choices Package", we are offering our "Comfort Foods Package". 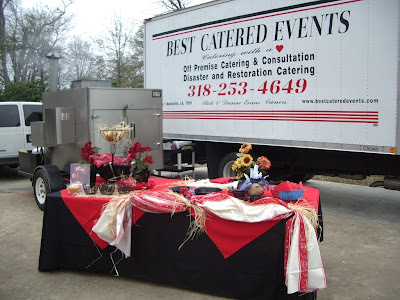 Now you can enjoy Best Catered Events food and know your guests will be impressed! This new menu is all about good food, served casual style. Call for details. 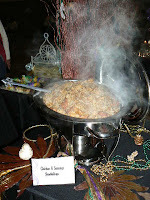 Sunday was the Natchitoches Bridal Show at the Events Center. Over 500 were in attendance and over 190 of those were registered brides! Best Catered Events showcased a little Asian flair, which is very different for this area. We also displayed our "summer garden themed table" with raspberry pink over black. We served Confetti Coleslaw in red Asian boxes we obtained from Lisa Teiger and Chef Andrew Alexander Crossan of CuisinEtc out of New York City. It was alot of fun to watch newbies try to conquer chopsticks. The "summer garden" featured our blt cherry tomatoes and our gourmet chocolate dipped Louisiana strawberries.